For a Saturday this was very busy, I had to wake up at my regular weekday time - there were a few tests to run at work. One of the engineers is over in China working on some new product and I needed to finish up a test so he would have the data when he got up (he is about 16 hours ahead). This only took me two hours to complete - I have not heard back from Jeff, hopefully this was all he needed to finish his work. bike pretty much came assembled from the factory. I needed to attach the handle bars, install the front brake, check and adjust the shifting, make sure everything was torqued to specification, inflate the tires and wipe it down. 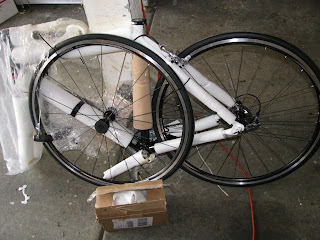 Friday I received two frame tube sets from Nova Cycles (http://www.novacycles.com/), one set is going to be my wife's touring bike and the other is for my single speed balloon tire commuter. Today was just the unpack and check to make sure everything arrived in tact. 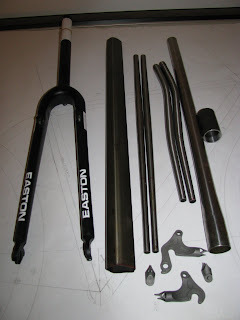 Sue's bike is a combination of Prestige, Nova, and Columbus tubing - the fork is an Easton EC90X. The fork is a surprise for her. 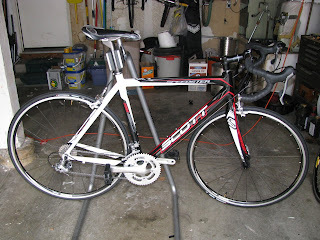 My single speed bike bike is just an off the shelf (for Nova) 29er tube set. 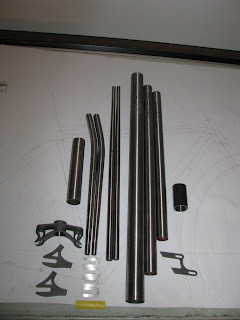 The majority of the tubes are 8/5/8 (.8mm butts with .5mm middle sections), the Seat tube is externally butted, and the down tube is a whopping 42mm! The plan is to ovalize the ends to get a better "flow" from one tube to another - not sure how this will turn out but it will be interesting. The rear dropouts are designed by Kirk Pacenti (http://www.bikelugs.com/), they are his track drop outs with stainless faces. For this bike I will have to build a fork since there is really nothing out there with the look I want that can take a 63mm with tire. I have decided to use one of Kirk's twin plate fork crowns, it should not look too out of place on this bike - but I am not sure. The next few weeks will be spent preparing, mitering, and brazing up these two frames. More pictures to follow. Sunday morning I will be meeting Scott at his gym to work out, so I have to sign off and get to bed.